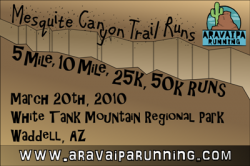 A local 50K run through the slot canyons and desert of Arizona. Ranked a #4 in Elevation Gain (out of 5) and #4 in Terrain (out of 5) on Ultrarunning.com. Hopefully a good tuneup heading into the Highline trail. The race was every bit as tough as expected. Heading through Goat Camp and down the big hill to the 13 mile aid station. The climb back up was tougher than it should have been and the Ford Canyon was as fun as expected. Finished 16th out of 81. 5:35.